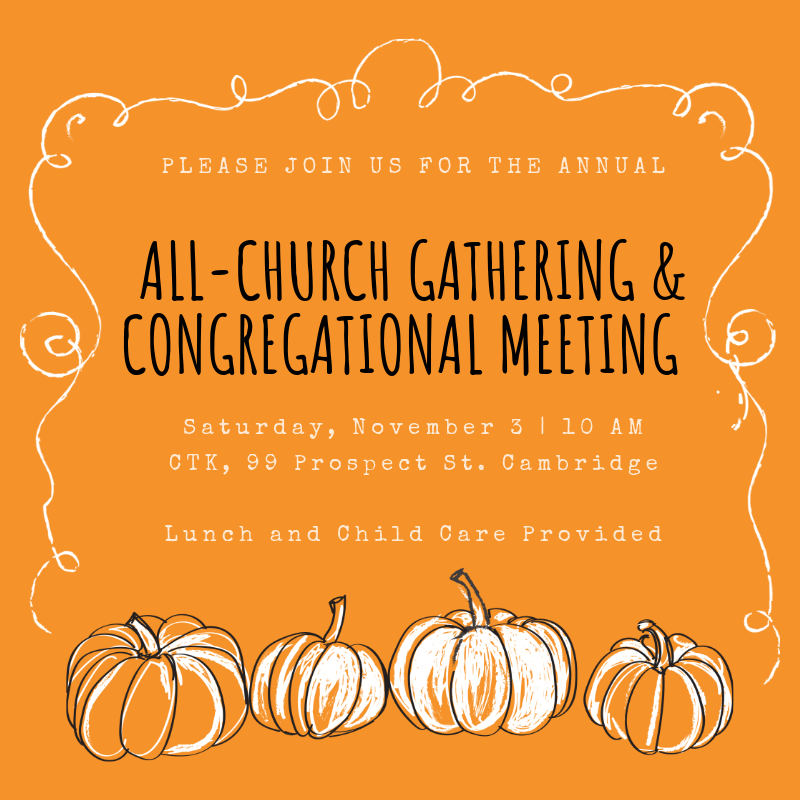 Our ALL-CHURCH WORSHIP SERVICE will begin at 10 AM on Saturday, November 3, 2018, at Christ the King Presbyterian Church, 99 Prospect St., Cambridge. The service will involve musicians from our various congregations. We’ll hear testimonies and updates from two of our church planting pastors, Sean Sawyers and Matt Owens. Rick Downs will preach. And we’ll share in the Lord’s Supper together. CHILDCARE will be provided in multiple age groups for kids ages 1 through 4th grade. Weather permitting, kids K through 4th grade will have some time at the playground. Youth 5th grade and up will participate in a prayer walk led by seminarian T.I. Atkins and RUF campus minister Nathan Dicks. After the service, at about 11 AM, we’ll have a CONGREGATIONAL MEETING to elect deacons and make announcements. Please refer to the announcement on our website for more information about that meeting. We need 120 members to show up to have a vote, so please come and bring your friends!!! Following the congregational meeting, we’ll enjoy a FELLOWSHIP LUNCH favorite Anna’s Taqueria. Take the Red Line to Central. Walk north on Prospect Street for 5 minutes. Hop on a bus. Routes 1, 47, 64, 68, 70, 70A, 83, 91, and CT1 are nearby. The Green Street Garage is a 7 minute walk away and costs $2 per hour. Lot 6 at 35 Bishop Allen Drive is a 6 minutes walk. $1.25 per hour / 4 hour limit. Street parking meters are $1.25 per hour with a 2 hour limit. Bring quarters! Check out the CTK Cambridge Directions & Parking page before you come for more information. Looking forward to seeing you on November 3!